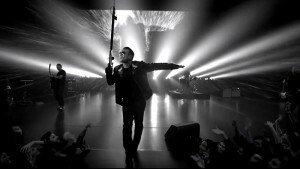 USA - Interactive light technology group, Marshmallow Laser Feast (MLF), harnessed the sharp, high output features of 185 Clay Paky Sharpys to create a hard-hitting, high-impact real-time lightscape for U2’s latest music video, which launched the band’s new single ‘Invisible’ on 4th February. Previous to that a 60" cut down version was aired during the Superbowl, on 2nd February 2014. This cut down video formed the basis of a commercial for the Bank Of America and supports Bono’s charity, RED, an initiative launched to encourage business and consumer power to work together to eliminate AIDS in Africa. 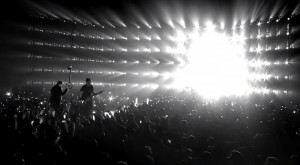 MLF, with Juliette Larthe and Mark Logue of Prettybird, collaborated to create a stunning, cathedral-like, interactive 3D lighting and video architecture that directly translated the band and audience’s movement into a striking video and light show. Grammy Award winning film director Mark Romanek (Never Let Me Go, One Hour Photo) of Anonymous Content directed both the commercial and music video. The project also employed the services of world class LD Patrick Dierson who worked alongside U2’s creative director, Jefferson Hack, and U2 themselves – all were an integral part of the creative process. "Infrared cameras are used to track the movement of the band. They then feed that information into The Punkerator, an application we developed specifically for this project, which translates real time sound and movement into light and video," explains MLF director Robin McNicholas. "This interfaces with a media server and works in sync with Protools and the lighting console to enable the lighting and video to mimic and directly respond to the movements of the band." In total 200 Sharpys were used to shine through the 360 degree semi-transparent LED screens: - 28 six Sharpy columns were positioned behind the main 360 degree LED wall (12m X 6m), with an additional 25 fixtures strategically positioned around the room. The effect was to deliver an entirely immersive and mesmerising experience. "This is the biggest project MLF has worked on with the Clay Paky Sharpys," states McNicholas. "It’s been a hugely exciting process. We’ve done a fair bit of R&D with the Sharpys and have already developed a number of applications to control them. For this project we created a super-integrated custom sound-reactive application in OpenFrameworks: - The Punkerator. We used it to track the motion of the band, via infrared cameras, and convert their movements into flowing lighting effects that utilise the Sharpys’ best characteristics. The goal was to amplify the raw energy of the gig and translate it into 360º immersive experience. "The Sharpys have proved themselves ideal for the artistic needs of a innovative outfit like MLF. Their sheer versatility hands creativity back to the artist. MLF would like to thank our colleagues Patrick Dierson, Lauren Barton, Anthony Randall of Chaos Visual Productions and the team from A-R-E.com, without which this project would never have worked." 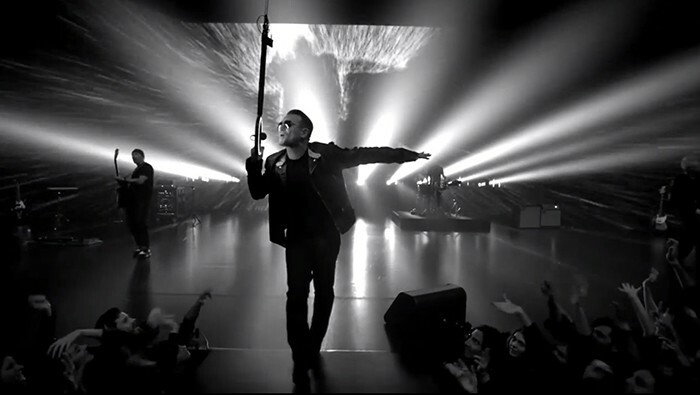 The U2 video will be used to promote a worldwide campaign which forms part of Bono’s charity, RED, and for a limited time - from the beginning of the Superbowl broadcast until 11:59 ET on February 3rd - U2’s latest single ‘Invisible’ was available as a free iTunes download. "We are incredibly thankful to Clay Paky for all their support," concludes McNicholas. "The Clay Paky management has been exceptionally supportive to MLF throughout the research and development process for The Punkerator app. This co-operation has resulted in a piece of technology that we’re hugely proud of and which we would have struggled to delivered without their support."